UDF's vice-chair and presidential hopeful Rumen Hristiov. File photo, Sofia Photo Agency. Rumen Hristov, the candidate of the Bulgarian Union of Democratic Forces (UDF), won the preliminary presidential elections within the rightist Blue Coalition on Sunday. Hristov overcame Svetoslav Malinov, the runner endorsed by the Democrats for Strong Bulgaria (DSB), the other participant in the coalition, preliminary results showed on Monday. The UDF representative got 55.74% (42230 votes), while the DSB representative got 44.26% (33532 votes). 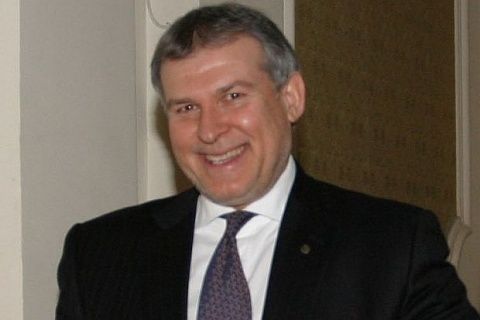 Rumen Hristov is a former Minister and vice-Minister of Agriculture, as well as advisor to Bulgaria's Presidents Zhelyu Zhelev and Petar Stoyanov, while Malinov is a DSB MP. Some 60 000 voters took part in the Blue Coalition's preliminary vote across the country, its representatives pointed out before the Bulgarian National Radio early on Monday. The Blue Coalition is a member of the European People's Party and initially supported the ruling centrist right GERB which took over in the 2009 general elections in Bulgaria, but subsequently moved into opposition. The coalition is co-chaired by Martin Dimitrov from UDF and former PM Ivan Kostov (1997-2001) from DSB.